Two masked men broke into a Northampton supermarket and threatened staff with a screwdriver. The men entered the Tesco Express store in Bordeaux Close, Duston, through a back door at about 10.40pm on Sunday. They initially threatened one member of staff but, when colleagues came to see what was happening, they ran away. Both men were white and had their faces covered. The first man was aged between 20 and 40, of average build and wore light-coloured gloves. His face was covered with a scarf. The second man was younger, skinny and wore dark clothes and a balaclava. 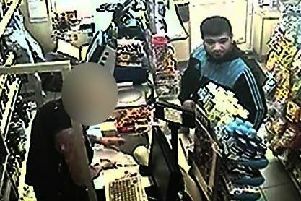 Witnesses, or anyone who knows anything about the robbery, can call Northamptonshire Police on 101.